Lung cancer is one of the leading causes of cancer death worldwide. Survival has not improved significantly in spite of newer therapies. In view of the high-symptom burden and severe morbidity, evaluation of quality of life (QOL) becomes important in these patients. Several instruments are now available for this purpose, and have demonstrated good correlation with performance status, symptoms, and survival. Quality of life assessments also help in comparing different therapeutic regimes, thus allowing selection of the appropriate modality. Problems of inconsistent interpretability and high-patient dropout rate poses a challenging problem that needs to be tackled. In spite of these drawbacks, QOL is now considered to be an essential component of lung cancer management and should be performed routinely. Such a practice will help the physician plan appropriate treatment strategies and set practical therapeutic goals. BACKGROUND / AIM: The best therapeutic modality for colon cancer "one of the most common malignancies of human being" is surgical resection of primary tumor. Adjuvant chemotherapy can help surgery to have a higher control and survival rate in high-risk resected patients, but the role of radiation therapy is the place of debate. This study was carried out to evaluate the possible role of adjuvant radiotherapy in such cases. 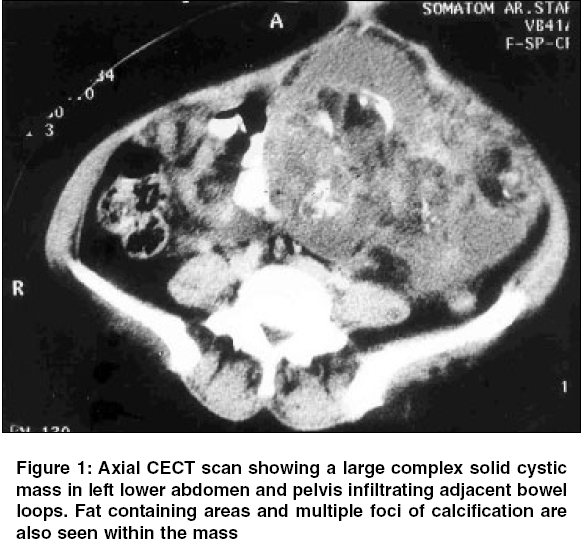 MATERIALS AND METHODS: This retrospective trial evaluated 65 eligible patients with surgically resected high-risk colon carcinoma (serosal and/or lymph node involvement), from May 1986 to February 2000. The patients were categorized into two groups. The first group was treated with chemotherapy alone and the other with chemo-radiotherapy. Chemotherapy included 5.FU 500 mg/m2/5days for 6-8 courses and radiotherapy consisted 45-55 Gy with 1.5-2 Gy/fraction. Minimum follow-up was 36 months. 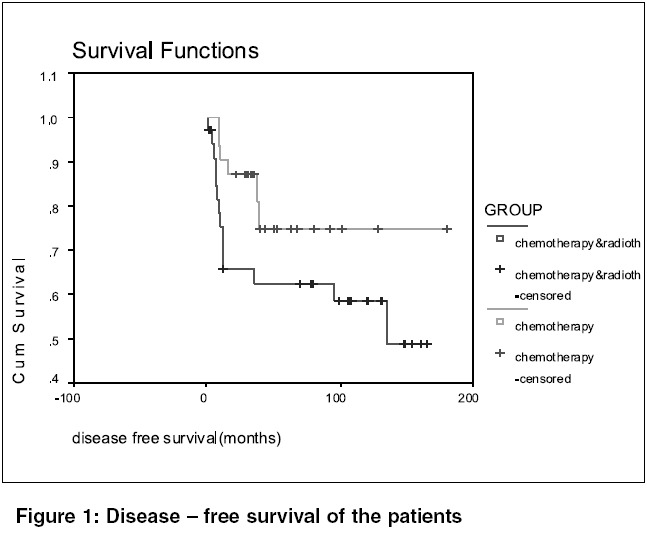 RESULTS: Mean event-free survival was 140 and 101 months in chemotherapy and combined-therapy groups, respectively (P = 0.099). Local recurrence rate was detected as 9.7% in the chemotherapy arm and 23.5% in the combined-therapy arm (P > 0.1). Treatment-related morbidity and mortality has been significantly higher in the radiation arm (P < 0.001). CONCLUSION: Postoperative external radiation as adjuvant treatment does not improve local control of the patients with colon carcinoma. BACKGROUND: Quality of Life (QOL) is an important health outcome measure in oncology. Given the underlying pressure of individual geo-political entities, a universal solution may not be applicable and hence there is a need to develop a regional tool and standardize the same to address the linguistic and socio-cultural factors. 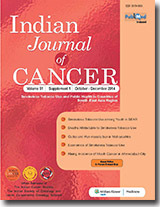 OBJECTIVE: To standardize a tool to assess the QOL of patients with cancer to suit the Indian scenario. Materials and METHODS: The samples were collected from the Cancer Institute (WIA), Chennai. Samples comprise of 400 patients with all sites and stages of cancer. Period: January 2001 to January 2002. Patients were in the age range of 41-60 years. Thirty-eight items were pooled from existing tools, reviews, and the field trial, by which face and factorial validity were established. Reliability of the tool was also tested. Correlation analysis was done to find out the relation between the domains of QOL. Statistics used: Principal component method with varimax rotation was used. Spearmen product moment correlation and Cronbach alpha coefficient were used for reliability analysis. RESULTS: Ten factors emerged with Eigen values ranging from 8.55 to 1.10 and accounted for 62.6% of variance. The first factor contributed maximally, 22% of variance. The remaining nine factors contributed totally to 40% of the variance on QOL. The ten factors that emerged were psychological well being, self-adequacy, physical well being, confidence in self-ability, external support, pain, mobility, optimism and belief, interpersonal relationship and self-sufficiency and independence. The internal consistency using Cronbach alpha test was 0.90 and split-half reliability was 0.74. CONCLUSION: The tool was found to be highly reliable and valid. It was feasible to administer it at clinical settings. Aims: To review the disease profile and treatment outcome of patients with primary skin malignancies treated at a regional cancer centre. Settings and Design: Surgical oncology unit of a tertiary care regional cancer centre. Evaluation of treatment outcome of patients with skin cancer from Surgical Oncology database was done. Materials and METHODS: Retrospective analysis of records of 77 patients with skin cancers treated between 1995 and 2002 was conducted. Profile of patients with skin cancer, surgical details including the management of primary tumour, regional lymph nodes and reconstructive procedures performed and survivals were analysed. Statistical analysis: All computations were done using the Statistical Package for Social Sciences (SPSS-9). Descriptive statistics were calculated in a standard fashion and survival analysis was performed using Kaplan-Meier method. Results: Skin cancers constituted 2.4% (77/3154) of patients with cancer treated in the surgical oncology department. 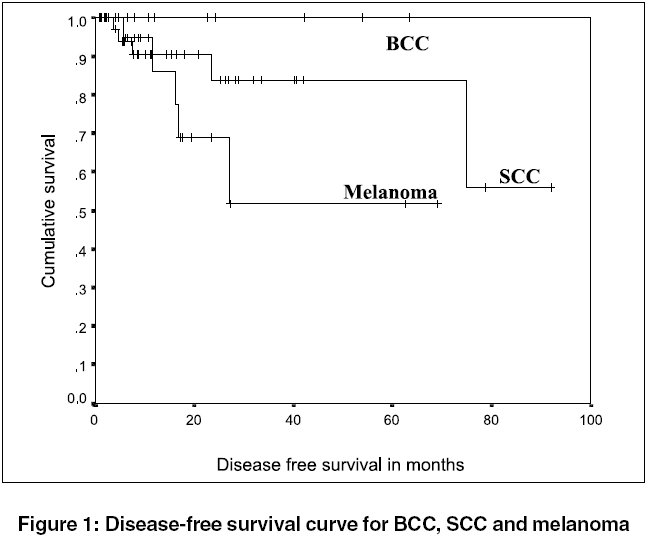 Squamous cell carcinoma (SCC) was the most common histological type (55.8%) followed by melanoma (26.1%) and basal cell carcinoma (BCC, 18.1%). Forty one percent of patients had undergone some form of intervention elsewhere before being referred. Reconstruction was required in 55.8% patients with large postresection defects. Regional lymph nodal dissection was required in 32.4% of total patients. Five-year median disease-free survival for the entire study population was 75%. Conclusions: Skin cancers constitute a small but significant proportion of patients with cancer. Unlike in the Western countries, SCC is the commonest histologic variety. Primary level inadequate intervention is very common. Optimal results can be obtained with radical surgery and optimal surgical margins along with a reconstructive procedure when needed. BACKGROUND: With the advent of prostate specific antigen the number of patients undergoing prostate biopsy has dramatically increased. The sextant biopsy technique has been conventionally used for the diagnosis of prostate cancer. Recently, concern has arisen that the original sextant method may not include an adequate sample of the prostate, hence it may result in high false negative rates. We conducted a prospective study to determine whether the 5-region prostate biopsy technique significantly increases the chance of prostate cancer detection as compared to the sextant biopsy technique. AIMS: To evaluate the efficacy of TRUS guided sextant and 5-region biopsy techniques in detecting carcinoma prostate in patients with PSA between 4 and 10 ng/ml and normal digital rectal examination. 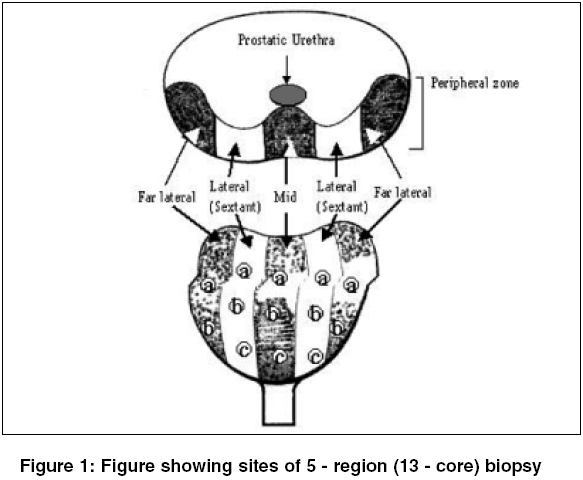 METHODS AND MATERIAL: Between December 2001 and August 2003 one forty-two men, aged 49-82 years, who presented with LUTS, normal digital rectal examination (DRE) and PSA between 4 and 10 ng/ml underwent TRUS guided sextant prostate biopsy. Serum PSA was reassessed after 3 months in patients whose biopsies were negative for cancer. If PSA was still raised, the patients underwent extensive 5-region biopsy. RESULTS: Mean patient age was 64 years and median PSA was 6.9 ng/ml. TRUS guided sextant biopsy revealed adenocarcinoma prostate in 34 men (24%). Median Gleason score was 7. Seven men (4.9%) had cellular atypia and 3(2.1%) had prostatic intraepithelial neoplasia (high grade). On repeat PSA estimation after 3 months, 48 patients showed stagnant or rising trend for which they underwent TRUS guided 13-core biopsy. Five (10.4%) patients were detected to have adenocarcinoma on repeat biopsy. Biopsy negative patients are on regular follow up with yearly PSA estimation. Complications included transient mild haematuria in14 patients (9.82%) and haematospermia in 4 (2.8%). Urinary retention developed in one patient and required an indwelling catheter for 4 days. CONCLUSION: Transrectal ultrasound guided sextant biopsy has shown a false negative rate of approximately 11%. A repeat 5- region (13-core) biopsy strategy can decrease the false negative rate of conventional sextant biopsy in patients with previously negative biopsies but persistently high PSA levels, high grade PIN or cellular atypia. Totally implantable venous devices (TIVD) are increasingly being utilized for venous access for chemotherapy of oncological patients. These devices considerably improve the quality of life of patients requiring long-term chemotherapy. However, despite the great usefulness of TIVDs, their insertion and maintenance is not free of complications. Many early as well as late complications associated with these devices have been reported. 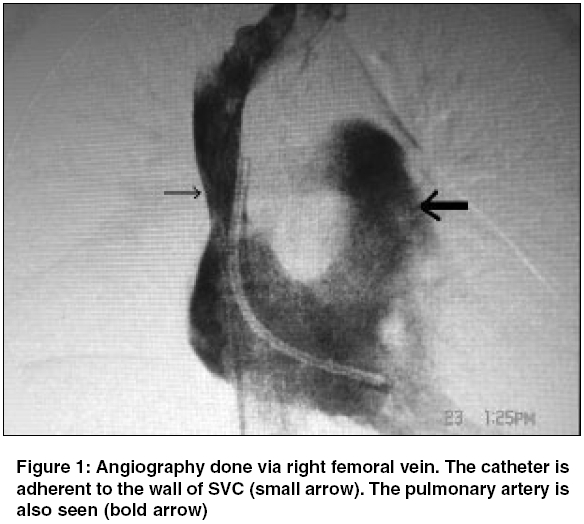 We report an unusual, silent, but potentially hazardous complication of catheter fracture and cardiac migration in a 16-year-old girl, in whom the port had been unused for 9 months before presentation. Percutaneous retrieval was unsuccessful as the catheter end was embedded in the myocardium. The catheter was removed via a midline sternotomy without any further complications. We have also reviewed the literature about the possible mechanism of this complication and discussed methods to recognize and avoid it. Chronic lymphocytic leukemia (CLL) is the most common type of leukemia worldwide. It is an indolent disease, almost exclusively of B-cell origin. Some CLLs evolve into a more aggressive lymphoid malignancy. The most common of these is Richter's syndrome. Transformation to acute lymphoblastic leukemia, plasma cell leukemia, multiple myeloma, or Hodgkin's disease (HD) may also occur. CLL patients are also at a significantly increased risk of developing a second malignant neoplasm later in life. One of the most common of these is HD. 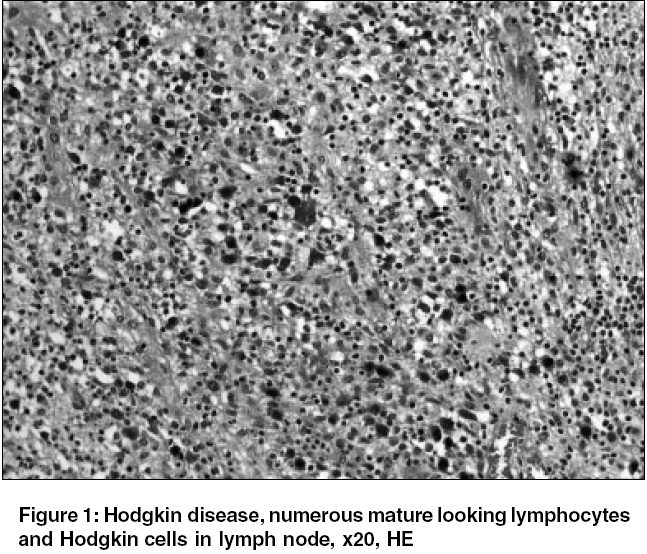 Herein, we report a case of HD in an elderly man with a history of B-cell CLL. Mesenchymal soft tissue masses are uncommon tumours of the chest. Myofibroblastoma is a recently described entity consisting of cells with origin from the myoepethelial cell, mostly seen as benign well-circumscribed neoplasms of the breast tissue. Though usually classified as a benign lesion, rarely it can be multifocal and prone to recurrence. 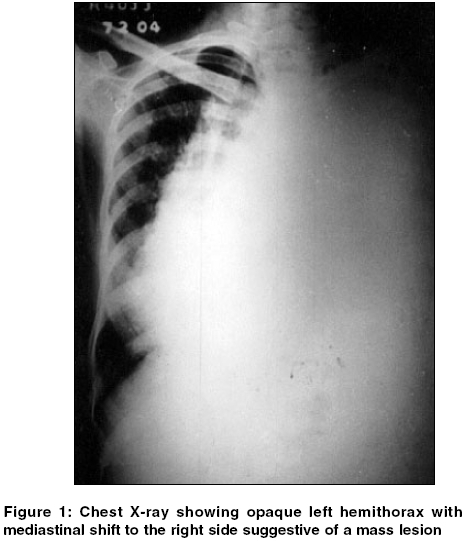 We describe below the case of a 26-year-old female who presented with exertional dyspnoea and evidence of a massive mass lesion in the left hemithorax causing mediastinal displacement to the opposite side. On histological and immunophenotypic analysis, a diagnosis of the very rare thoracic myofibroblastoma was made. The incidence, salient features, pathological differential diagnoses and treatment are reviewed.